One of my favorite things besides candy is coffee, so I couldn’t believe my luck when I received a huge, beautifully packaged box of Starbucks Chocolate to review! Yes, folks, Starbucks Coffee Company is now in the chocolate business. Starbucks has partnered with Hershey’s, whose subsidiary Artisan Confections Company, itself comprised of Joseph Schmidt Confections, Scharffen Berger, and Dagoba Chocolate, manufactures the Starbucks Chocolate. Did you get all that? Basically, Starbucks Chocolate is being made by people who know their chocolate. I have to confess that while I was wowed by the attractive packaging, I was prepared to be underwhelmed by the chocolate. Starbucks coffee is not quite full-bodied or flavorful enough for my taste, so I figured the chocolate would be geared toward a similar palate. I am happy to say that I was wrong. 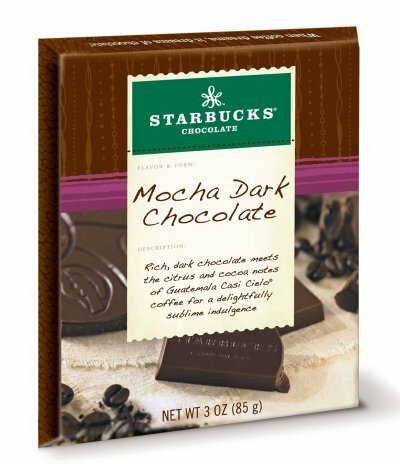 Starbucks chocolate, with just a few exceptions, is rich, full flavored, and thoroughly enjoyable. Ferrero Rocher. 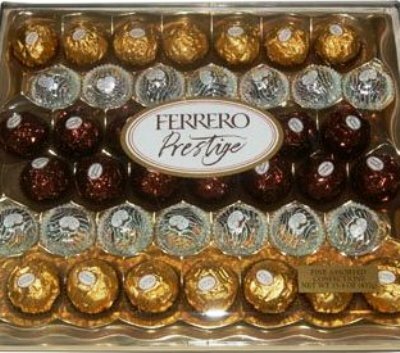 Ferrero Rondnoir. Ferrero Garden Coco. They just sound fancy, don’t they? And make no mistake: they certainly are. Jasmine over at the “Confessions of a Cardamom Addict” Blog briefly mentions Pop Rocks Truffles from Godiva in two recent posts here and here. I can’t find any other reference to them anywhere online and even Godiva’s Truffles page doesn’t mention them. Either Jasmine is making this up or it’s a well-kept secret. They sound good though. I need to email Jasmine and ask her about it. Has anyone else seen/tried these? Anyway, she then goes on to experiment with Pop Rocks and she uses them in a cookie recipe she calls PopStar Cookies (the cookies are star-shaped). I love Pop Rocks – I never thought about using them in recipes – what other recipes would Pop Rocks be good in? I always thought putting them on ice cream would be good but I have never actually tried it. Nope, not making them up and not suffering from any culinary delusions. The Godiva in question was the one on Bloor Street in Toronto. They had a sample plate of the bonbons out and, get this, they weren’t for sale in the “pick and choose” case. IIRC, they were part of a box of preselected candies, and I think you only got *one* in the selection…quite unfair…I’m sorry, but I don’t recall what *that* particular collection was called. I don’t think it’s part of Platinum, but I could be wrong. The truffles they had out had a berry centre, into which the candies were mixed. I don’t recall any distinguishable lumps, so I can only assume the candy was ground to a certain extent. They were enrobed in an ivory couverature with raspberry-red stripes. Similar fizzy truffles were also available in either milk or dark couverature (can’t remember) with orange stripes. I didn’t try the chocolate ones, so I don’t know if they too were berry-flavoured, but The Fussy Eater had one. I just asked him if it was raspberry-flavoured or something different–he doesn’t really remember but he thinks it could have been orange (which would make sense with the colours used). Now…*I* call them Pop Rock truffles (because of the fizziness)…I’m sure if you ask the chocolatiers they’ll have some swanky name for it…but all of us in the store agreed they were Pop Rocks. I quickly looked at Godiva’s site when I originally posted, but couldn’t find them…. I’ll send a note to a couple of friends who live/work in the area and see if they can either head over *or* call in for the candy’s real name and let you know.